Canadian powerhouse KATAKLYSM is set to release their twelfth studio album Of Ghosts And Gods this summer on Nuclear Blast. The new artwork from KATAKLYSM's explosive new album was done by up-and-coming dark and macabre artist Art by Surtsey (www.facebook.com/ocvltadesigns). 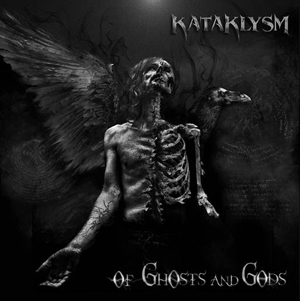 The new KATAKLYSM album cover echoes a sinister artwork depicting the reality of humanity’s beautifully disturbing existence and its impending death through the Mortal and the Everlasting. The background shows an ancient incantation written in Aramaic. In 2013, KATAKLYSM won the “Metal Band of the Year” Award at the renowned Indie Awards ceremony in Ontario, Canada and soon after, was nominated in the “Best Metal/Hard Album of the Year” category at the prestigious Juno Awards (Canada’s equivalent to an American Grammy).